Indeed, every week, in season, enjoy the presence of a local farmers market at the campsite. Every Tuesday evening, discover the different products of our producers. We have found many craftsmen, lovers of their profession, who will give you the best preparation advice. Charcuterie, fresh cheeses, sausages, jams … so many fresh products to tantalize your taste buds! So do not miss the appointment from 18:30 to 20h, every Tuesday evening. If you want to pick your own fruit, 10 minutes walk from the campsite, enjoy the Vergers du Lac. An ideal setting where sales of fruits and vegetables are made. You can pick apples and strawberries and attend fruit juice workshops. All to spend a good afternoon with family or friends. Fresh products, an ideal setting, a family atmosphere, discover the freshness of this place! The store is open from Tuesday to Saturday from 9h to 19h. For more information do not hesitate to contact them at 02.51.41.53.75 or send them an email on lesvergersdulac@hotmail.fr. • CLISSON : Tuesday morning in the covered market place (food only). Friday morning in the Notre Dame district, Place du Minage, Place Saint Jacques, Place des Douves (large artisanal market). 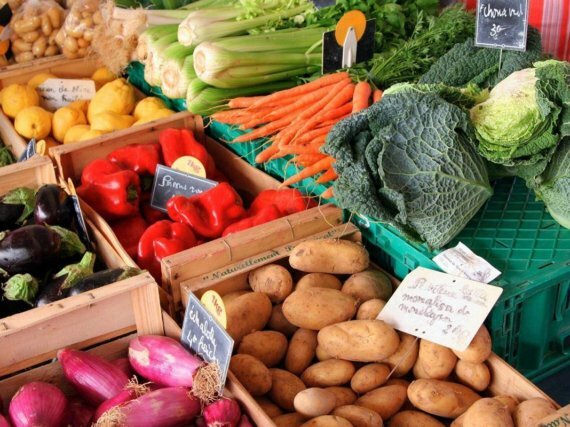 • MONTAIGU : food market every Saturday morning, Place de la Mairie frol 8am to 12.30pm. • TREIZE-SEPTIERS : small food market on the second Wednesday of the month on the square in front of the youth hostel.